The Ministry of Agriculture, Rural Development and Fishing is planning a celebration of WDCD in all 48 provinces (wilayas). The celebration will involve the participation of managers, companies, investors and the youth, as well the as the minister of Agriculture, Rural Development and Fishing. The Ministry of Quality of Life and Sustainable Development celebrated the World Day to Combat Desertification on June 17. A series of awareness raising activities was organized in Agouna, the commune of Djidja Zou, south-west region of Benin. 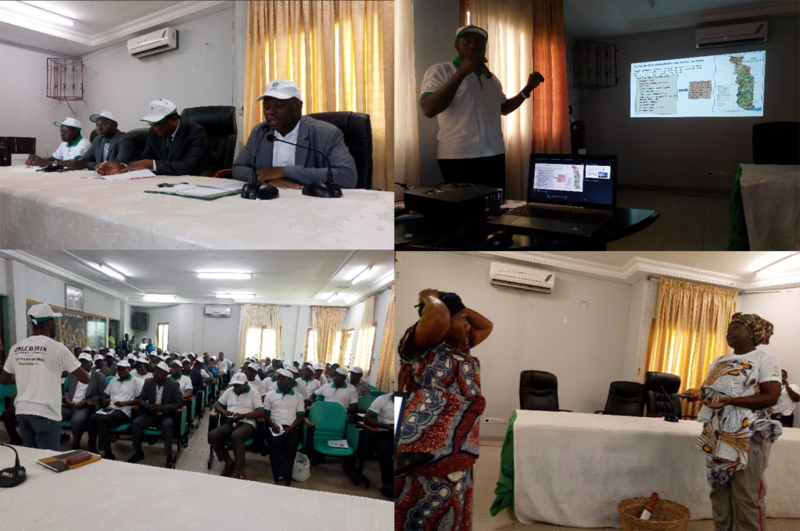 The awareness raising activities aim to highlight importance of sustainable land management to preserve and restore ecosystems, remind the public that the natural resources of Benin are strongly threatened by deforestation and exploitation of natural resources. The activities included planting of 5000 teak trees, awarding and recognizing farming practices, a televised public forum on "Desertification and Land Degradation, Where Do We Stand?". Representatives from local authority, Members of National Committee to fight Desertification, General Director of the Ministry of Quality of Life and Sustainable Development, ProSOL and GIZ were present at the public forum. 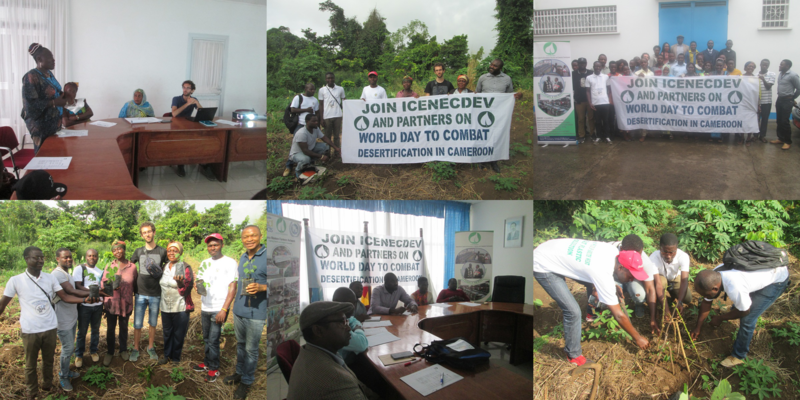 Under the theme “Land has True Value”, ICENEDEV commemorated the World Day to Combat Desertification 2018 on 18 June at Conference Rome of Fakoship Plaza adjacent Mountain Club Buea from 9:00 to 12:00. The event showcased success stories of empowering smallholder women farmers in Cameroon besides featured expertise sharing by Luca Castellanza from University of Mannheim, Germany. An overview of the outcomes of 13th Session of the Conference of Parties to United Nations Convention to Combat Desertification (UNCCD COP13) was also shared with the audience. 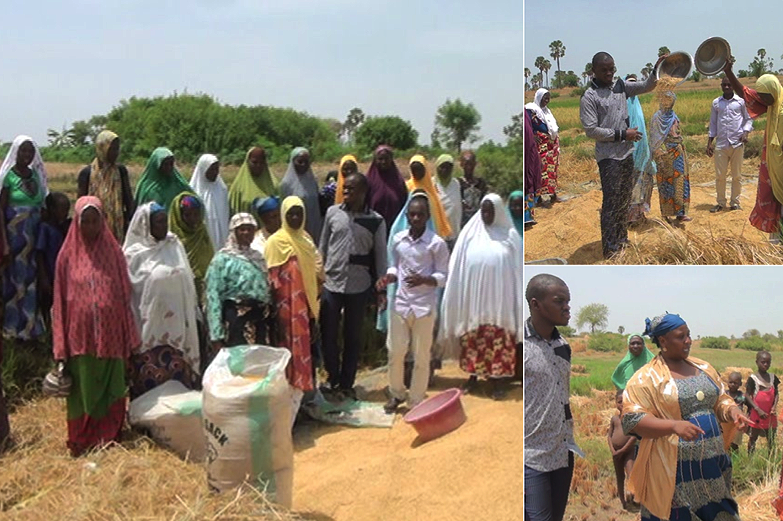 In addition, ICENECDEV and smallholder women farmers group carried out a sustainable land management field project on 16 June as part of the World Day celebration activities. The Ministry of the Environment, Nature Protection and Sustainable Development organised a series of awareness-raising events on 21-22 June to celebrate the World Day to Combat Desertification. These included i) panel discussion with regional chiefs to highlight environmental issues created by deforestation, unsustainable agricultural practices and uncontrolled bush fires; ii) tree planting activity which saw 700 young people participated in planting 1000 trees in six different locations; and iii) contests that drew nearly 1000 students participation and 50 of them received prizes. The events also gained wide coverage of print-media and were broadcasted on more than ten national TV channels and radios. The Ministry of Environment and Sustainable Development organised an awareness-raising and teak tree planting event on 19 June to mark the World Day. The event which was held in Tébissou, attracted more than 100 over participation. Desert Research Center plans to celebrate the World Day at the end of June after the feast of Aid El-Fitr. The details of the observance activities are being finalized. 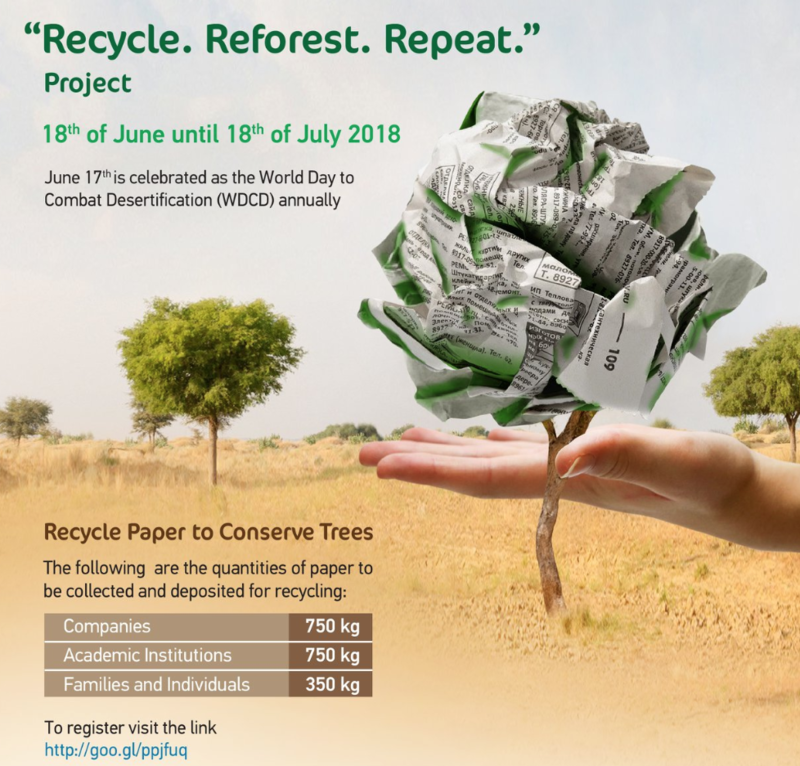 On the occasion of the World Day to Combat Desertification, the national newspaper (Eritrean Profile) published an article on WDCD and the message of the executive secretary of UNCCD on June 16, 2018. The message was also broadcast in local media in different languages. 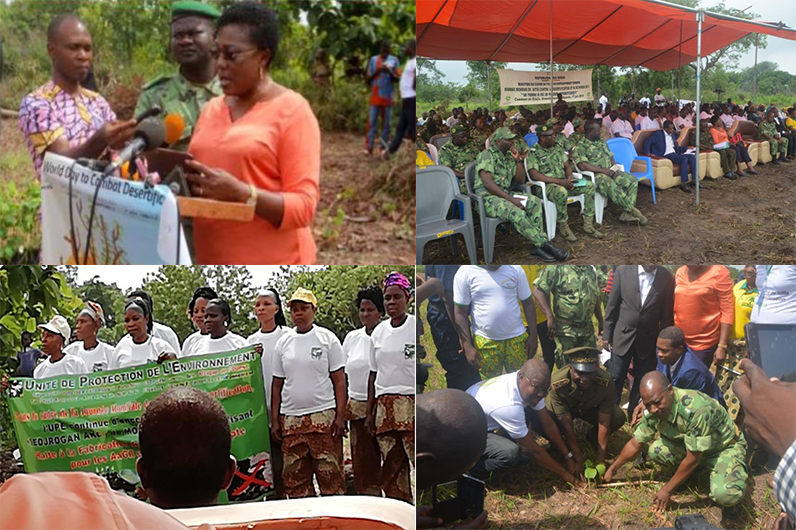 The Environmental Protection Agency, the Ministry of Environment, Science, Technology and Innovation in collaboration with the Ministry of Food and Agriculture and other agencies observed the World Day to Combat Desertification in Talensi District of the Upper East Region. The Forestry Commission, National Disaster Management Organization, the Parliamentary Select Committee in Environment were among of the participants who joined the celebration. Monitory exercises of Sustainable Land Water Management Project (SLWMP) were carried out at three communities as part of the event activities. This year’s Kenya national commemoration of the World Day to Combat Desertification (WDCD) will take place on 17 June at Oldonyo Nyokie School, Magadi in Kajiado County. The county committee has endorsed various activities to commemorate WDCD, including tree planting, a procession, exhibitions, media (TV & radio) talk shows and newspaper coverage raise public awareness on the WDCD theme “Land has true value, Invest in it.” The national event will be attended by the Deputy President of the Republic of Kenya Honourable Mr. William Ruto; the Cabinet Secretary for the Ministry of Environment and Forestry Honourable Mr Keriako Tobiko; Principal Secretary, Mr Charles Sunkuli; Director General of NEMA, Prof Geoffrey Wahungu and the Chairman of the Board of Management of NEMA, Mr. John Konchellah; and the host Governor Ole Lenku. Safaricom, Tata Chemicals, UNDP, KEFRI, Vi-agro-forestry, KIRDI, KALRO and the Kajiado County Government are among the partners and sponsors of the national commemoration of the World Day. The Ministère de l'Environnement, de l'Ecologie et des Forêts of Madagascar organized an event on 15 June to observe the World Day. The event featured a screening of a movie about combating desertification, an exhibition and a panel discussion. 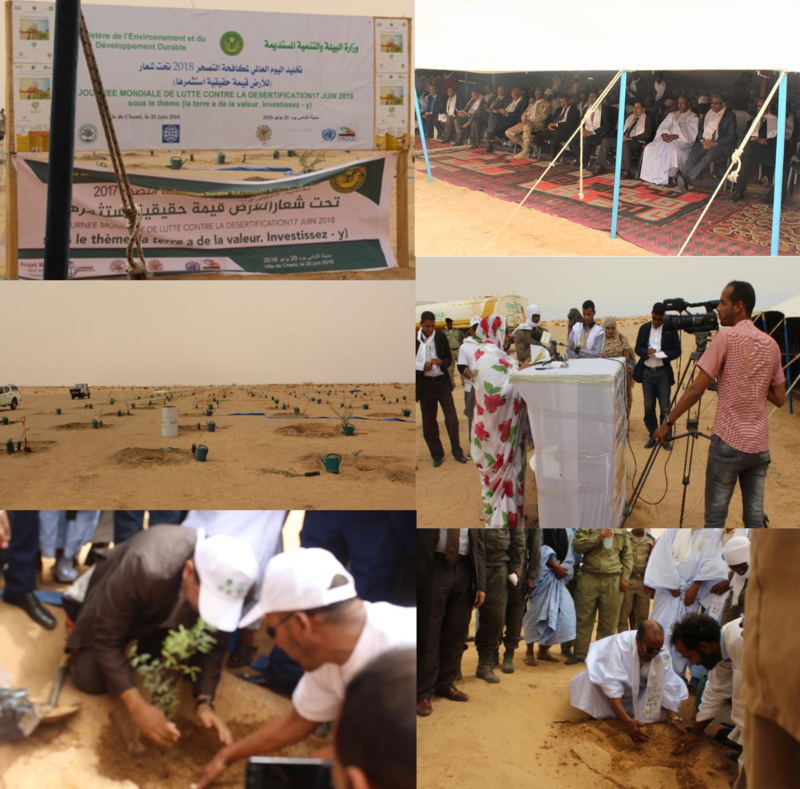 The Mauritania Great Green Wall Agency (ANGMW), the Civil Society Network for Environment Protection (RSPE) and the Ministry of the Environment and Sustainable Development celebrated the World Day to Combat Desertification on 20 June in the city of Chami, north-west of Mauritania. The event which took place in a traditional aimed to raise awareness of the link between poor land management and land degradation in Mauritania. Land actors were urged to work together to achieve Sustainable Development Goal 15 and Land Degradation Neutrality. The event ended with tree planting activity which saw planting of nearly 1000 in a two hectare land. The event was covered by the national TV and Radio stations, and national press association. The Ministry of Agriculture, Fishing, Rural Development, Water and Forests will be celebrating the World Day to Combat Desertification on 12 July 2018, 9 am at the National Zoological Garden. The goal of the event is to raise awareness of the severity of desertification and the need to work together on a global scale to reduce it's impacts. The event also stresses the importance to move towards a new model of development which promotes sustainable innovations and good practices of land management that will also address issues of climate change. Representatives of the high commission and the UNCCD will give the opening remark for the event, follows by screening of a documentary film on desertification, and a series of presentations on ways to combating desertification. 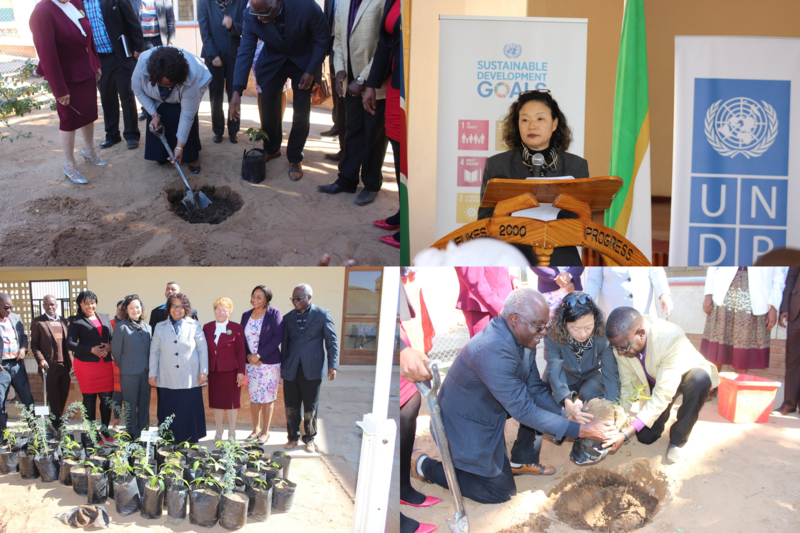 The Ministry of Environment and Tourism in partnership with the Ministry of Agriculture, Water and Forestry and the United Nations Development Programme (UNDP) in Namibia marked the World Day to Combat Desertification on 27 June. The event took place in Rehoboth, an agricultural hub, south of the capital city Windhoek. The event aims to raise awareness about desertification and encourage good practices in land management. A series of thematic presentations was presented and discussed by various institutions. The event ended with a tree planting activity. The African Network of Young Leaders for Peace and Sustainable Development (ANYL4PSD), a youth organization in Africa, organized a 2018WDCD campaign in Maradi, Niger and Maroa, Cameroon to mark the World Day. The campaign aims to popularize sustainable land management practices in local communities through the engagement of young people and women. The “Fédération des Unions des Éleveurs Producteurs” du North Niger (Sahel) will celebrate the World Day by launching a tree planting activity on 3 August 2018 during the rainy season. The event that will take place at Tchintabaraden aims to leave a legacy for future generations to fight the effects of desertification, excessive tree cutting and over-exploitation of natural resources. To commemorate the World Day to Combat Desertification the Centre for Earth Works will be organising an event on 29 June 2018. Talks on WDCD and Sustainable Development Goal 15: Life on Land as well as a panel discussion on the importance of land in achieving the Sustainable Development Goals will be the highlights of the event. Association pour l’Environnement et le Developpement Durable de la République du Congo organised an event on 17 June, the occasion of the World Day to Combat Desertification in Brazzaville. The event highlighted the importance of the engaging different stakeholders i.e. the State, the private sector, NGOs, local communities and the youth in preventing land degradation and restoring degraded lands. Over one hundred participants attended the event, including representatives of the government agencies involved in land management, focal points of the Rio Conventions, members of the panel on Land Degradation Neutrality and civil societies. 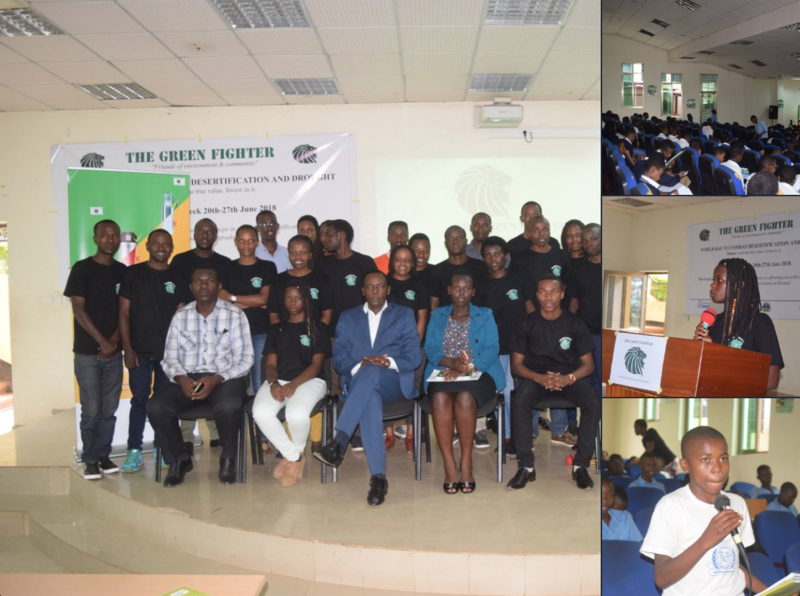 The Green Fighter, a youth organization of University of Rwanda, celebrated the World Day by empowering the primary school children in Nyarugenge district on 20 June. The team presented information on desertification, land degradation neutrality and the role that youth can play in fighting desertification and land degradation. In conjunction to the 21st Session of the African Forestry and Wildlife Commission (AFWC) which was held in Dakar, the Government of Senegal celebrated the World Day to Combat Desertification and Drought under the theme “Land has a true value: Invest in it” on 20 June at the Mbao Forest, the “Dakar lung", together with local communities. The government also called for increase investment in land restoration. A public-private partnership project on land restoration was also showcased during the meeting participants' field visit to the “Bandia Nature Reserve” on 22 June. Students of the Mont Fleuri primary school joined forces with the Ministry of Environment, Energy and Climate Change, the Environment Trust Fund and the Seychelles National Park Authority to plant 300 endemic palm trees on the occasion of the World Day to Combat Desertification. The event with the aim to engage young people / school children signified the role of young people in protecting the environment and conserving land resources. On the occasion of the celebration of the World Day to Combat Desertification, the Deputy Minister of Environmental Affairs, Ms Barbara Thomson released a statement urging South Africans to move away from unsustainable land use practices and make a difference by investing in the future of land. Additionally during her Parliament Address recently during the Department of Environmental Affairs’ Budget Vote Speech, Deputy Minister Thomson reiterated the country’s commitment to meeting their Land Degradation Neutrality (LDN) goals. 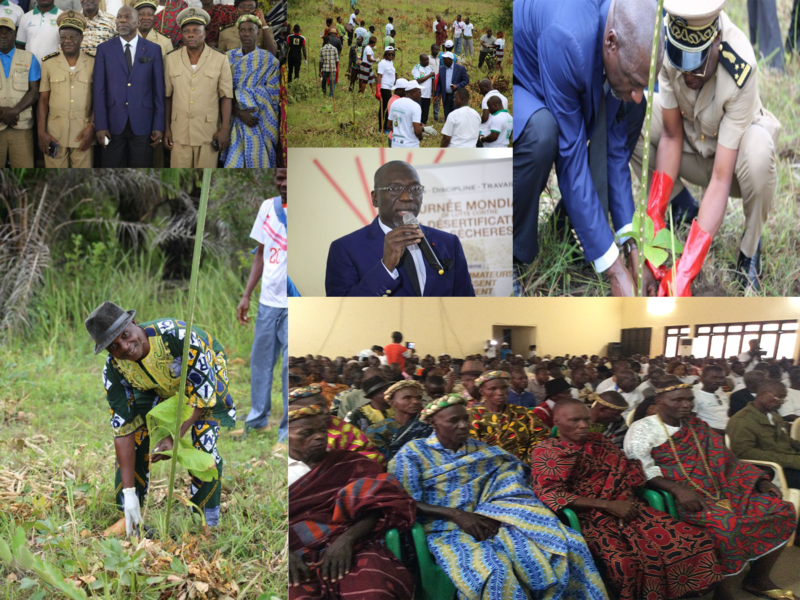 The Association des Pépiniéristes et Planteurs de Tône-Ouest (SONGOU-MAN) will mark the World Day on 17 June by planting 1600 trees as part of the yearly reforestation programme. 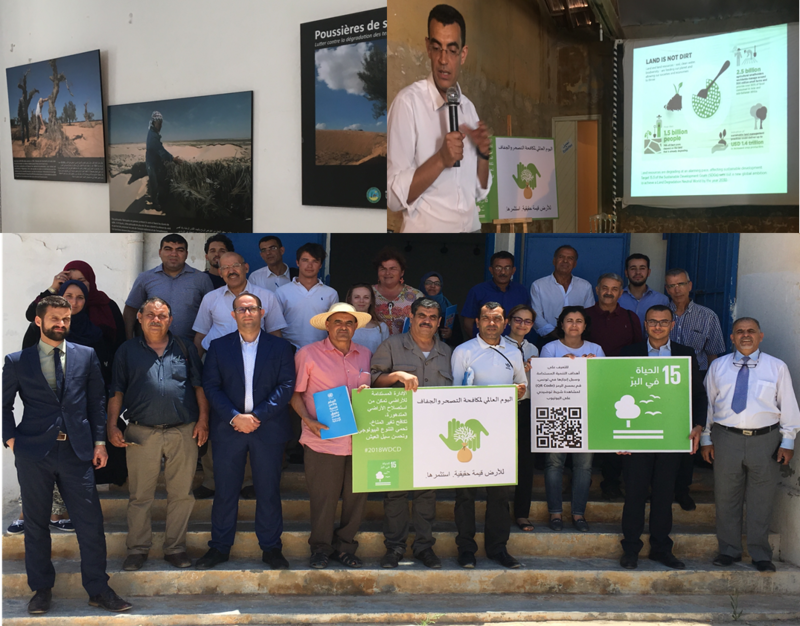 The Ministry of the Environment and Forest Resources organized an event to mark the World Day to Combat Desertification on 26 June 2018. At the event, the Ministry showcased the impacts of deforestation in Togo and shared the country Land Degradation Neutrality targets and implementation plans with about 100 audience who attended the event. The event also gained wide coverage from Eco Conscience TV, Republique Togolaise, Quotidien Togo-Presse. In Tunisia, the United Nations Information Centre (UNIC Tunis) and the Association for the Protection of the Island of Djerba (ASSIDJE) – a non-governmental organization – organized a “get-together” with civil society organizations (CSOs) from across the country to discuss challenges and opportunities pertaining to land degradation neutrality. The event which was opened by Mr. Michael Hage, FAO representative in Tunisia, took place on 22 June 2018 in Djerba at the Cultural Mediterranean Centre (Centre Culturel et Touristique Méditerranéen) in Houmetessouk. Invited guests included Mr. Hamda Aloui, UNCCD National Focal Point, who spoke about Tunisia's commitments under the Convention and highlighted the importance of pursuing Land Degradation Neutrality. The programme also featured presentations by IRA Médenine, a prominent research institution focusing on drylands, the GEF Small Grants Programme and the UN Resident Coordinator's Office. The Sustainable Development Goals -- SDG 15 in particular -- was in focus with the screening of an explanatory video (Arabic with subtitles in French) produced by UNIC Tunis. The event ended with a debate with CSOs focusing on community-based and social entrepreneurship initiatives that promote sustainable land management in Tunisia. The Department of the International Cooperation of the Ministry of Agriculture, Forestry and Fisheries of Cambodia will organize an awareness-raising event on 15 June to celebrate the World Day. The event will take place at the Phnom Tamao Zoological Park and Wildlife Rescue Center in Takeo Province. About 550 participants, including ministers, governors, ambassadors, senior government officials, partners, NGOs, students and farmers are expected to attend the event. The National Forestry & Grassland Administration, together with other relevant agencies, will organize a high-level event on 14 June, 2018 in Yulin city, Shaanxi Province to mark the World Day to Combat Desertification. This event aims to advocate the significance of combating desertification for poverty alleviation and rural revitalization and to increase public engagement in desertification control at the national level to achieve Land Degradation Neutrality. The event will be joined by Chinese high-level officials, representatives of Chinese local provinces and numerous enterprises. The participants will visit a tree planting demonstration site. In the latter part of June, The National Forestry & Grassland Administration will organize an International Seminar on techniques of desertification control and ecosystem rehabilitation in Gansu Province. Some twenty technicians and officials from affected developing countries will attend the seminar. The China International Youth Exchange Center, with the support of UNCCD secretariat, organized the event “A Greener China – 2018 International Youth Eco Movement” on 26-27 May 2018 to honour the World Day to Combat Desertification. The event raised awareness of young people locally and internationally on the importance of combating desertification and land degradation, and the role youth can play in conserving natural resources. About one hundred people from local youth groups, international youths and local government bodies participated in the two-day event. 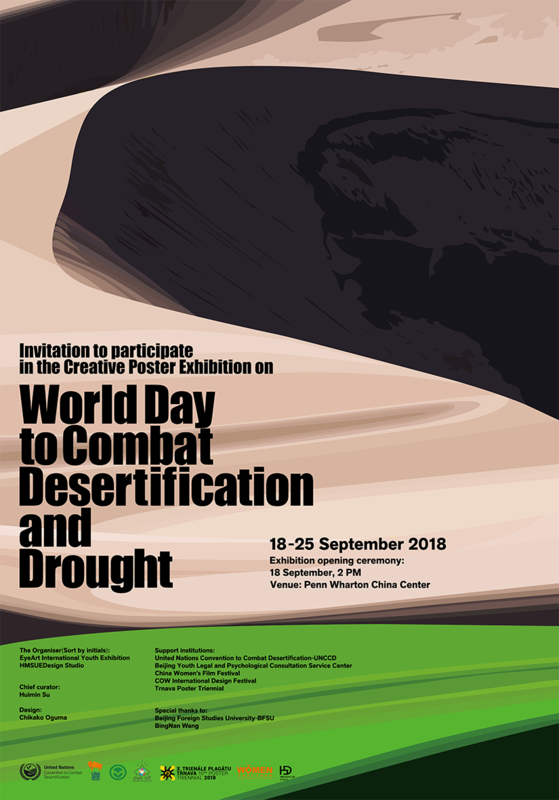 The EyeArt International Youth and The HMSUEDesign Studio are organizing an exhibition to raise public awareness on the topic of desertification on 18-25 September, 2018 in Beijing City. To increase the impact of the event, the exhibition brings together foreign and local designers to share their creativity to highlight the importance of land. A social media promotional campaign is launched to draw the crowds. Huimin Su, founder of HMSUEDesign，winner of the United Nations “Imagination 2030” and the UN Geneva Open Day Poster Contest and Exposition. He is also a jury member of Muse Creative Awards International Creative Design Award 2018, ACM SIGGRAPH SpaceTime 2018, and International Student Poster Competition. Ministry of Environment, Forest and Climate Change is actively commemorating WDCD with a variety of events. India is also the host country for the World Environment Day this year and on this occasion, the Ministry will take part in the exhibition that will showcase the country’s efforts towards meeting goals and objectives of UNCCD. Grameena Vikas Samithi and a farmer’s group, Cumulus STAAR, Kalroadpally, celebrated WDCD by undertaking a field action in Kalroadpally village, Andhra Pradesh. The organizer demonstrated the bund strengthening, gully control and plugging, planting of tree seedlings and the sowing of green manure crops in the common fields to improve the farmers' skills in sustainable farming. SPAN Network plans a field-based action to observe the World Day. On 17 June, they will organize a series of actions targeting farmers and focused on the conservation of biodiversity, such as planting of fruit and shade trees, organic farming and vermicomposting demonstrations, as well as presentations on resource management and preservation. Hoths Organization for the Human Services in Prakasam District of Andhrapradesh organized a workshop and essay competition among school children to celebrate the World Day. 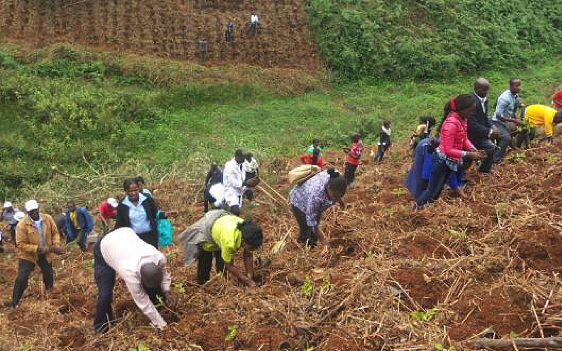 Familial Forestry has organized two special tree planting events to mark the #2018WDCD. On 5 June, in Sangriya, District Hanumangarh, Rajasthan, an estimated of 500 participants turned up to celebrate the World Day while on 17 June a dialogue with the communities on land degradation issues was held in Loonkaransar, District Bikaner, Rajasthan. Later the participants joined hands to combat desertification by planting trees. They also organised several other events during the month of June, for example clubbing trees with marriage ceremony. 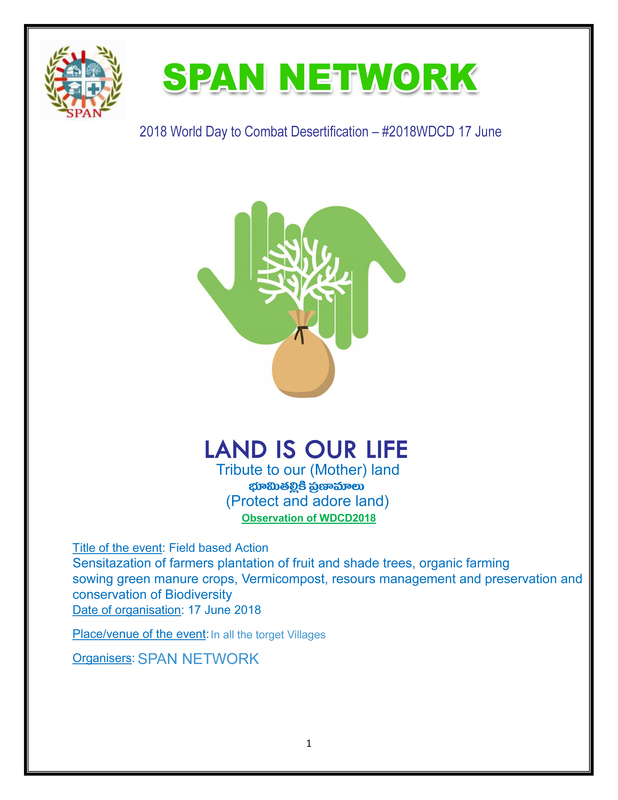 The SRI KRISHNA Farmers Club of Gondipalli village is organizing field based actions on 17 June to celebrate WDCD2018. The Krityanand UNESCO Club Jamshedpur India will conduct a research program from June 2018 to December 2018, based on the theme of 2018 WDCD “Land has true value. Invest in it”. 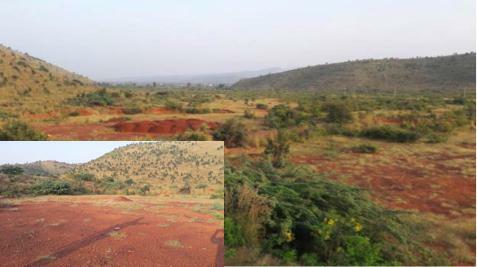 The research will focus on identifying sustainable land management (SLM) policies, beneficial for boosting bio-economy. The program will address issues faced by land managers, such as various SLM approaches, restoration technologies, or measuring and monitoring SLM implementation. 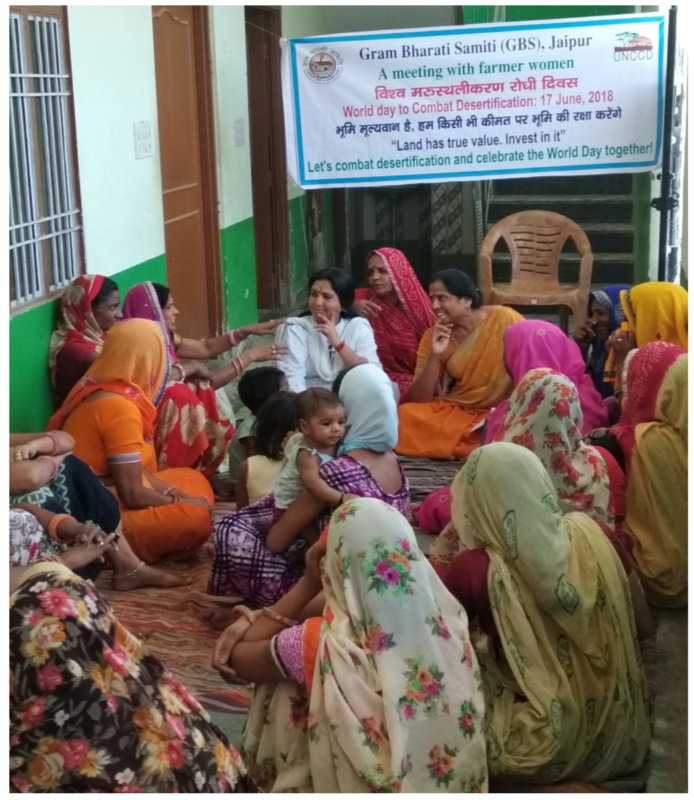 Komal Bal Avam Mahila Kalyan Sanstha, an organization of women's groups, marked the World Day on 9 June, 2018 by organizing an awareness-raising event in Pushkar, Ajmer, Rajasthan. The event included a women's rally in Pushkar market, a puppet show and a workshop to promote conservation of land resources as a way to ensure drinking water safety. 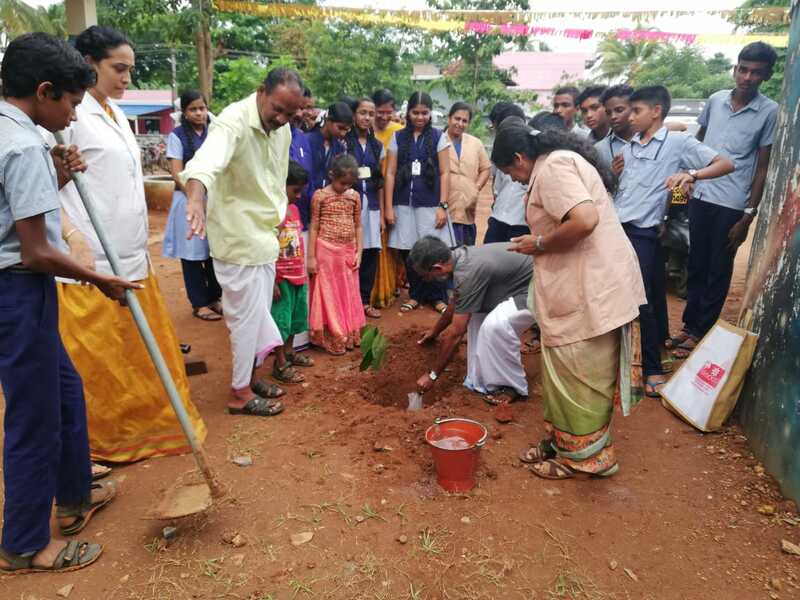 Matha HS MANNAMPETTA, a local NGO in India, celebrated World Day on 18 June by engaging communities in planting medicinal value plants in Thrissur. MATHRUBHUMI SEED held several awareness-raising activities including debate, painting competition and a rally at Trivandrum Monvila Bharatheeya Vidyabhavan School to mark the World Day on 17 June. Environmental activist Mr. Pallipuram Jyakumarand Uma Trideep also gave a talk to students on the importance of conserving land resources. The organization also implemented a green protocol in the community to fight desertification. 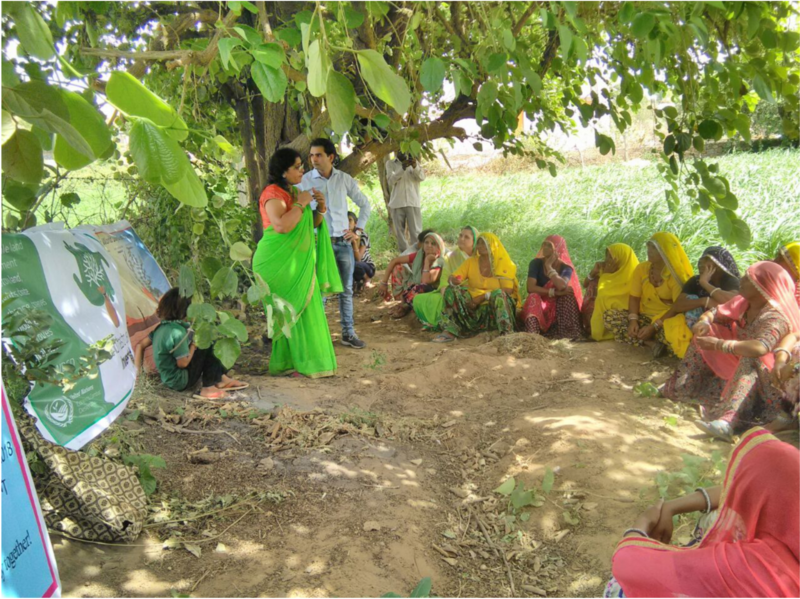 Gram Bharati Samiti (GBS) organized a group discussion with the women farmers in village Kukas (Jaipur). Komal Bal Evam Mahila Vikas Sansthan organized a meeting with women farmers and landless labourers in Pushkar. Munnidevi, the organizations secretary, has explained that harvesting rainwater on farms can help conserve the soil and limit further land degradation. She advised women that cultivating crops that require less water along with planting fruit trees on farm margins can increase farmers' income and improve the quality of the land. 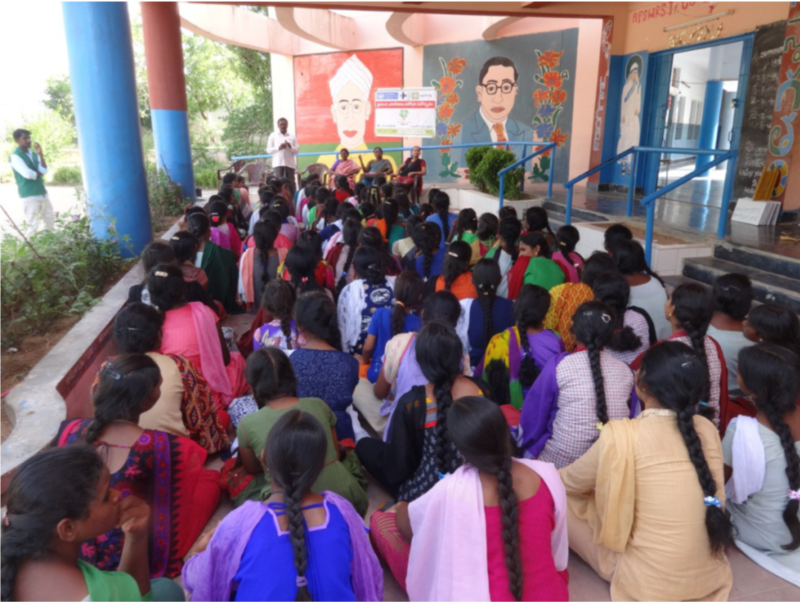 An awareness workshop was organized by Grameen Manav Kalyan Shikshan Sansthan Kachroda for women farmers and NGO employees at a the Ganpati Nagar school. Participants of the women self help groups have expressed their concern over abandoned lands, water scarcity and effects of climate change that had increased the burden for women who shoulder most of the household responsibilities, such as managing water supply, fodder for cattle and crops harvesting. They also discussed the issue of safe drinking water, a major concern that is relevant for nearly one hundred fifty villages. 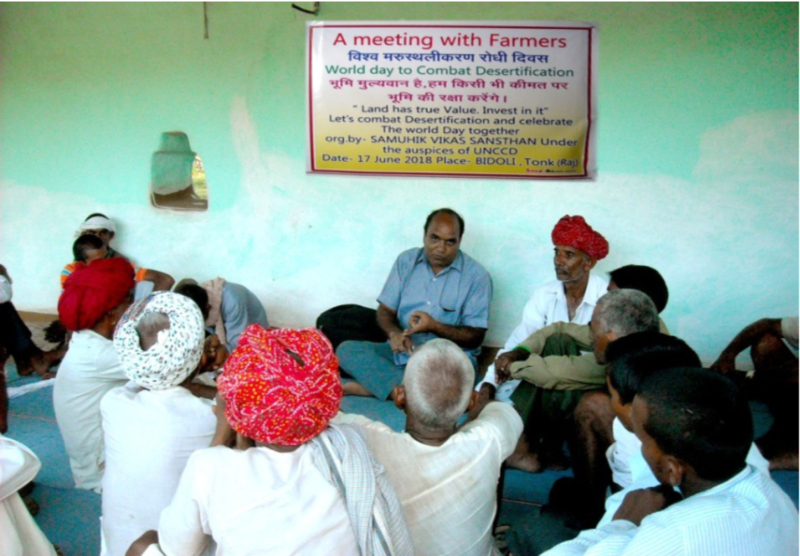 Samuhik Vikas Sansthan Newai (SKSN) organized a group discussion with local farmers in the village of Bidoli, Rajasthan, India to mark the World Day. The discussion highlighted causes of severe land degradation and dust storms that have affected over one hundred local communities in Rajasthan earlier this year. Munnala Rao, the secretary of SKSN, exchanged opinions with the locals on how to reduce the impacts of severe weather events. The discussion ended with a local commitment to adopt sustainable land management practices, such as tree planting on a larger scale. 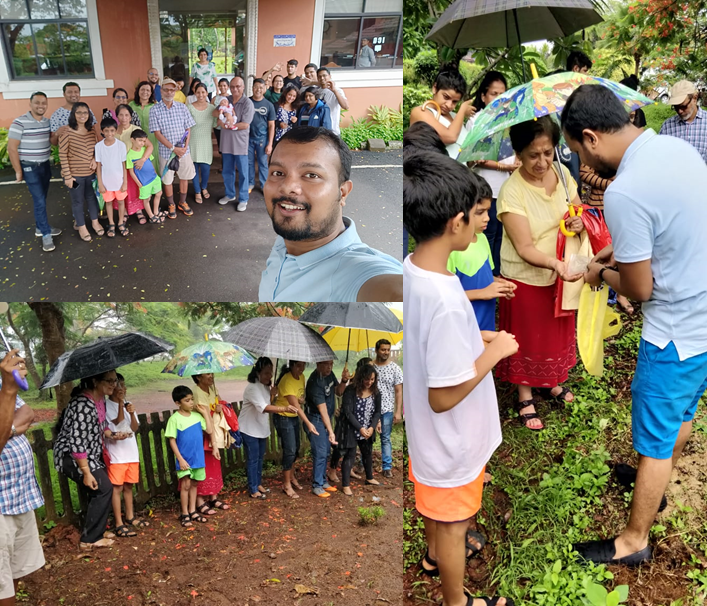 To mark the Word Day, a group of concerned citizens in Goa gathered on 17 June and started their own initiative planting seed-balls containing variety of indigenous trees in Dona Paula. They made the WDCD pledge and committed to reduce and recycle paper waste, and plant more trees on community grounds. The group also discussed possible initiatives and actions to raise local communities awareness on land degradation issues and ways to achieve land degradation neutrality at local level. This local initiative also captured the attention of local media. More information about the event coverage by Herald Goa. The Forests, Rangelands and Watershed management Organization (FRWO), a focal institution of UNCCD in Iran, will mark the World Day with a publication on land issues and the importance of combating desertification on Jangal va Marat (Forest and Rangeland) Journal. The magazine is published quarterly and widely disseminated across the country. It is accessible online here. Ashti Cycling organized a cycling excursion with the slogan “riding for nature” on 16 and 17 June 2018 to mark the World Day. The event aims to raise awareness of the importance to conserve land resources. The Alaghsan Foundation for Agriculture and Environment Development organised a public presentation to mark the World Day to Combat Desertification on 01 July 2018 in Yarmouk, Baghdad. The presentation "Our water, our life, our future." showcased the present management of Iraq's water resources and Iraq's efforts to combat desertification and drought". In addition Alaghsan Foundation also held a meeting with the representatives of the Ministry of Water Resources, the Ministry of Science and Technology, the Ministry of Higher Education, the Ministry of Agriculture and the Ministry of Environment to discuss risks and impact of drought and desertification that may be faced by the agricultural lands.They also discussed the effect of the Aliswa dam that the block of the flow of Tigris waters to the agricultural land. 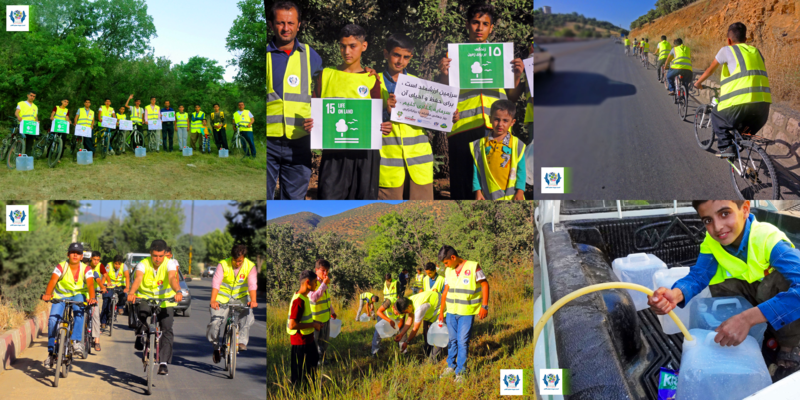 The Jordanian Society for Desertification Control and Badia Development (JSDCBD) celebrated the World Day to Combat Desertification (WDCD) on 17 June 2018 by organizing a series of awareness campaigns. A drawing competition entitled "Our students and the environment" was also launched and had attracted more than 1000 students participation. JSDCBD also published children stories related to desertification, and scientific books, pamphlets, posters related to conservation of land, soil and natural resources. To mark the World Day to Combat Desertification, a youth organization Amido put together a mini-football tournament among the teams of Semey, Kazakhstan on 14 June, 2018. Science and technology workshop "Combating desertification technology, approach and investment". Public event “Land has true value. Invest in it” at the Institute of Geography and Geoecology, Ulaanbaatar. Broadcasting a short video clips on importance of the land degradation prevention, mitigation and restoration. Children and Youth art contest "Land has true value"
Voice of Animal Nepal Kathmandu (VOAN), a non-governmental organization in the Kathmandu, organized an awareness-raising event to celebrate the World Day on 17 June. The event featured a public presentation on desertification and drought, and a tree planting activity to raise awareness among the local population. 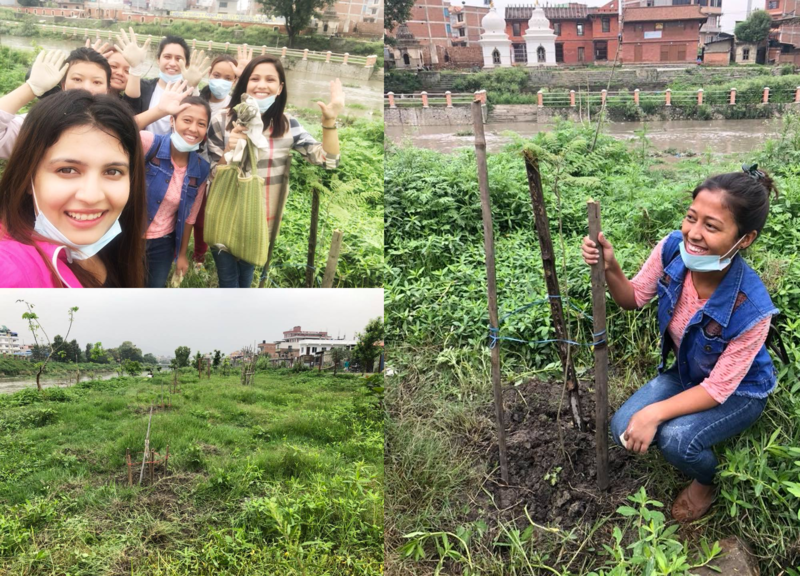 The tree planting activity, which will be managed by Ward Chairman of Lalitpur Metropolitan city, took place along the river bank of Bagmati River near Manmohan Park at Balkhu of Lalitpur District. The “Urban Green and Clean Project” organized by Tourism Development Endeavors and PowerShift Nepal on 17 June in Kathmandu to mark the World Day. The event, which aims to create public awareness on the importance of green spaces in urban areas, brought local communities together to plant trees in “Ward 10 and 31” of Kathmandu. The Ministry of Environment and Climate Affairs (MECA) of the Sultanate Oman marked the World Day on 27 June. A series of events were organized to encourage wise investment on sustainable land management. MECA also called for more local communities participation to combat desertification and take proactive actions to address drought. The events included giving public presentations on the framework of the; highlighting the economic and social importance of sustainable land management practices in the areas where frankincense trees are found; and launching of a documentary film on desertification and its impacts to Oman. The events were widely covered by the local media. 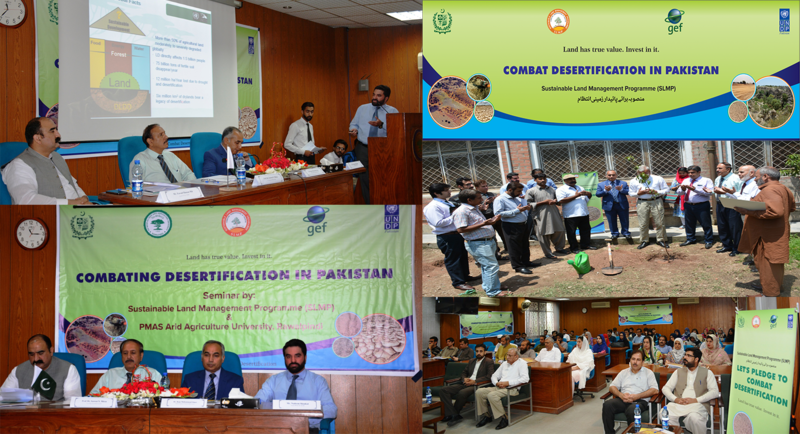 The Ministry of Climate Change with the support of the UN Development Programme (UNDP) Pakistan, the Global Environment Facility (GEF) and the Sustainable Land Management Programme (SLMP) organised a seminar to mark the World Day to Combat Desertification at the Pir Mehr Ali Shah Arid Agriculture University Rawalpindi on 18 July 2018. The seminar focused on the true value of land which is not limited to monetary value. During the seminar, there was an urgent call to adopt smart agricultural practices, conservation of water and investment in organic produce. Dr. Raja Muhammad Omer, Deputy Inspector General of Forest at the Ministry of Climate Change announced new efforts to combat desertification, namely the implementation of sustainable land management programmes in 14 dry land districts, in all four provinces. After the seminar, a tree planting ceremony was launched by the Deputy Inspector General of Forest. The event was widely covered in local news: TheNews, Daily Times, Dawn and the Daily Business Recorder. The Bureau of Soils and Water Management, the Philippines UNCCD Focal Point, marked the World Day by hosting a Land Degradation Neutrality forum on 14 June 2018, to raise awareness on sustainable land management. The event brought together representatives of national government agencies, civil society organisations, research institutions and academies. A presentation on the value of land beyond its economic value and measures to achieve Land Degradation Neutrality and presentation of the Philippines LDN National Report were part of the event activities. In addition, an hour discussion on WDCD theme “Land has true value, invest in it” was aired by a local radio station to outreach more public audience at national level. On 17 June the Ministry of Municipality and Environment launched a campaign to distribute seeds and seedlings of wild plants to winter campers to mark the World Day to Combat Desertification. The Ministry distributed about 4,000 packets of seeds and 11,000 seedlings of wild plants ‘Al Najila’ quack grass to the campers to rehabilitate the degraded pasture land. Another 1,500 seedlings of local wild plants including acacia tortilis, acacia ehrenbergia, lycium shawii will be distributed to the locals as part of the campaign efforts to plant indigenous wild plants to combat the wide spread of desertification in the country. On the 28 June 2018, the Land Development Department, the National Focal Point of UNCCD, organized a public presentation "The importance of WDCD and pathway for the implementation of the Convention" and exhibition to celebrate the World Day. The event which saw nearly 500 participation, included Mr. Suradesh, the Director General of Land Degradation and Desertification, took place in KhonKaen, northeast of Thailand. The event addressed the issue of salinization in soil, which is a key problem in the region and the importance of investing land in a sustainable way. It also showcased private initiatives in land restoration and the use of green/ solar technology in reforested saline land. The Emirates Environmental Group will be launching their annual month-long paper recycling project “Recycle. Reforest. Repeat” on 18 June. The objective of the project is to create awareness at the grass root level on the need to preserve the environment by engaging the community in a constructive activity with a target to accomplish. The project will require EEG’s corporate, academic and student members to submit paper waste for recycling. The target collections are 750 kg of paper for EEG’s corporate and academic members and 350 kg of paper for EEG’s student members. From 8-17 June, the Centre for Sustainable Rural Development (SRD), Vietnam, in collaboration with project partners, organized a series of awareness-raising activities to celebrate WDCD. The main event was held in Central Province of Vietnam together with the Centre for Agriculture Extension Quang Nam to highlight issues of desertification and its consequences, as well as educate the public about the objectives of WDCD. About 100 participants – mostly young people – joined the event and planted a hectare of forest trees. A training was held in Son La province in the Northern mountainous area of Vietnam on 11 June to train local communities on compost production to increase soil fertility. The training, attended by forty people, concluded with planting of fruit trees as a symbol of commitment to conserve land and improve the livelihood of local people. On 17 June, the Ministry of Agriculture and Rural Development /the UNCCD Viet Nam focal point organized a tree-planting event to mark the World Day to Combat Desertification. The event, which took place at the University of Fansipang in Lao Cai province, was attended by 200 participants. Among them were representatives of the Vietnam Forest Administration (VNFOREST), local government, forest protection department, university lecturers and students. In addition, a workshop under the theme "The role of community in sustainable forest management" was organized to address land degradation and promote sustainable land management (SLM). The workshop brought together experts and leaders in SLM practices, to exchange and share learning experiences in combating land degradation. The events also drawn the media attention that helped spread the message of the World Day. The Ministry of Agriculture, Forestry and Water Management of Republic Srpska, in cooperation with Faculty of Agriculture and Faculty of Forestry of University Banja Luka, organized a workshop at "Andelak" Kindergarten to mark the World Day. The workshop under the slogan "Stop Land Degradation" aimed to raise awareness among the young children on the importance of healthy land and soil. An internal experts workshop that brought together colleagues and partners working on land issues.Integrated and cross-sector actions to achieve land degradation neutrality and sustainable land management, as well as best practices were discussed and shared. 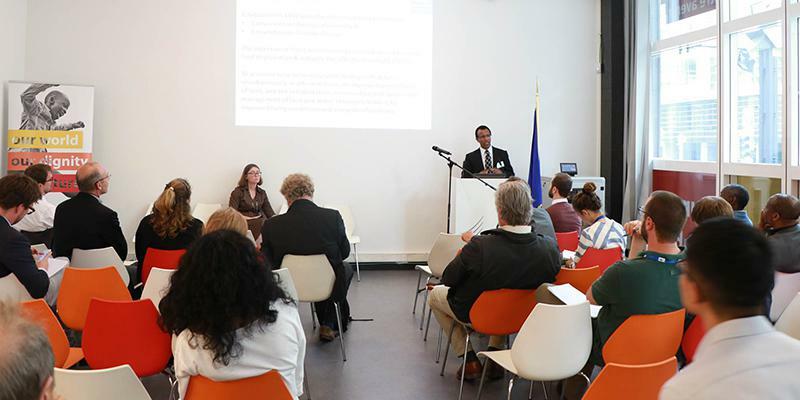 A presentation which focused on getting land issues into the political agenda and promoting integrated sustainable land management actions was held at DEVCO’s InfoPoint (12:30-14:00). The event gave opportunity to showcase specific examples of how partner countries tackle the desertification together, lessons learned, concrete solutions and tangible achievements on the ground. On the occasion of the World Day to Combat Desertification 2018, the Working Group on Desertification (GTD) and CARI launched an online campaign to raise awareness on desertification and its related issues to people living in drylands. The campaign which include an online petition, appealed to the government to give more attention to the issue of land degradation such as its causes and consequences, besides sharing ways to fight land degradation. World Day to Combat Desertification, 2018 was celebrated in Georgia with the focus on promoting sustainable land management as an way to regenerate economies, create jobs and revitalize communities. 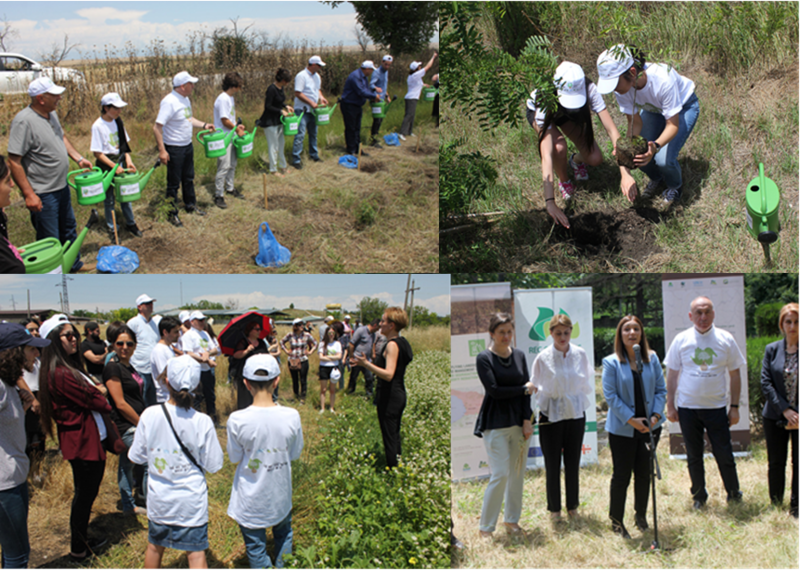 The Ministry of Environmental Protection and Agriculture of Georgia in collaboration with the Ministry of Regional Development and Infrastructure and the Dedoplistskaro Municipality City Hall as the host of the occasion, organized a tree planting activity to mark the World Day. The event has drawn participation from local farmers, national and local media representatives, students and school children, local civil society organizations. 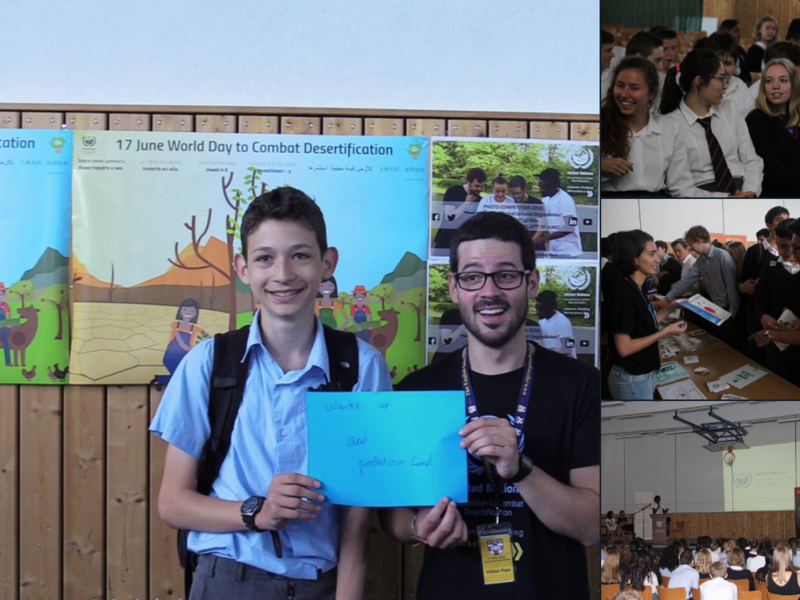 The UNCCD Capacity Building Marketplace organized an event to celebrate the World Day to Combat Desertification at St. George’s International School in Cologne on 15 June 2018. 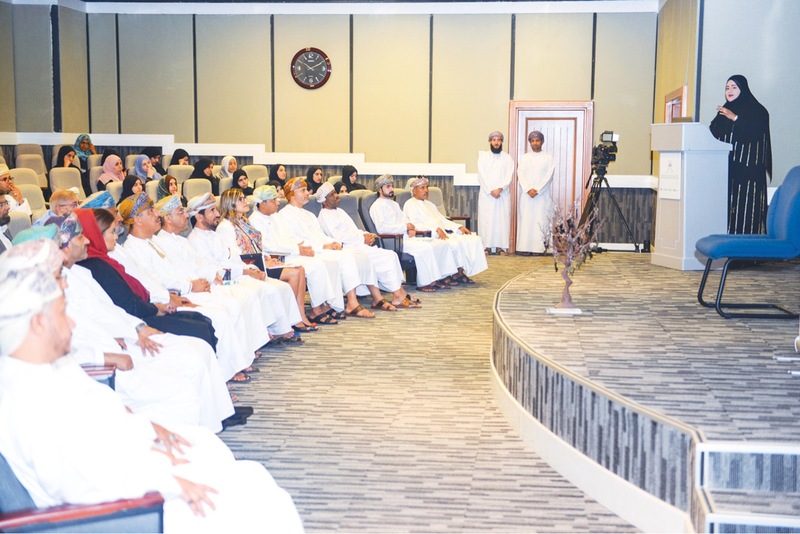 The event featured a lecture on desertification and land degradation, as well as highlight simple actions and lifestyle changes that individuals can make to help address global challenges. Exhibition and social media engagement campaign were used to further spread the message. 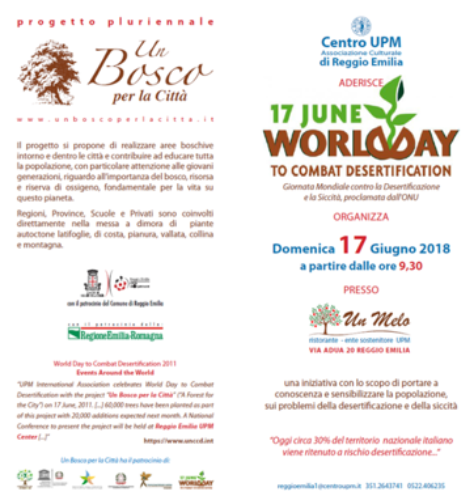 The restaurant "Un Melo," an affiliate of the International Association Un Punto Macrobiotico, will be organizing an awareness-raising event on 17 June, 2018 from 9.30 am to 6.00 pm to celebrate the World Day to Combat Desertification. The event will take place at Reggio Emilia and will be inaugurated by Sabino Caldelari, the honorary chairman of UPM of Reggio Emilia and Ms. Valeria Montanari, Councillor of the town of Reggio Emilia. 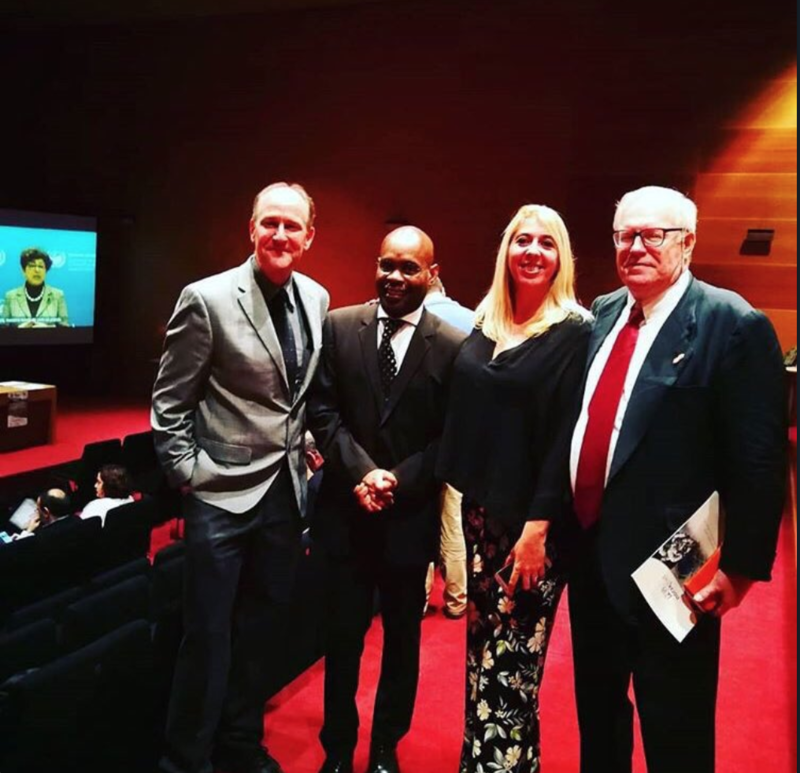 Fundacion Agreste, together with the Cultural Affairs and Public Diplomacy department of the USA Embassy in Madrid, organized an international conference on “The Value of Fragile Ecosystems for Sustainable Development” that took place in Pontevedra on 5 June. The conference aims to address the importance of fragile ecosystems in the sustainable development agenda and on valuing the services they offer, encouraging investment in initiatives to achieve Land Degradation Neutrality. As part observing World Day to Combat Desertification, the European Commission Joint Research Centre (JRC), the Instituto Tecnológico de Canarias (ITC), the Spanish Meteorological Agency (AEMET), the Universities of Salamanca, the Autónoma de Barcelona and the Castilla-La Mancha Las Palmas de Gran Canaria (ULPGC) organized a series of conferences and round tables from 18 - 20 June to address the effects of climate change, drought risks and vulnerability the Canaries may face in near future. Under the slogan “Invest in Land, Invest in Future,” the Ministry of Forestry and Water Management of Turkey marked the World Day to Combat Desertification on 20 June, 2018. The event took place at the OGM Conference Center, Sogutozu, Ankara. Painting, essay writing and poster competitions were part of the event features. 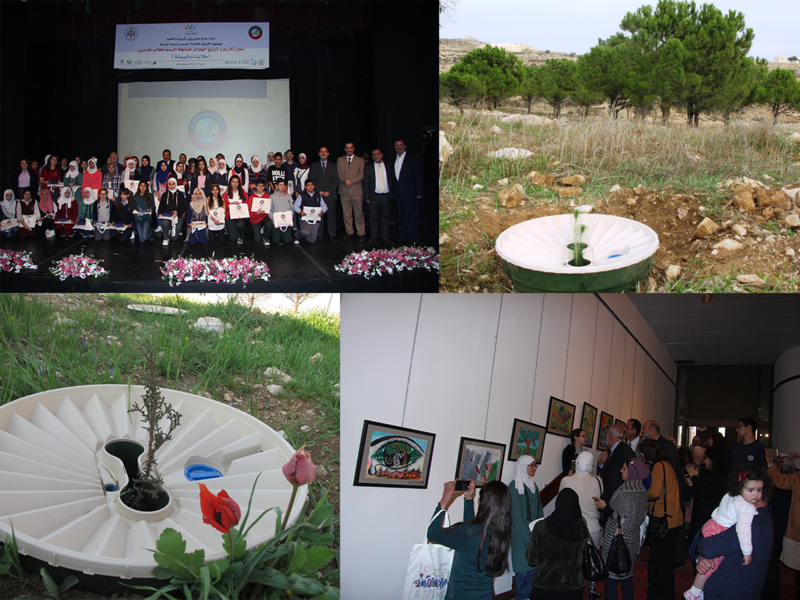 The winners' art works were displayed at shopping malls in Ankara to raise public awareness on the true value of land. To celebrate the World Day to Combat Desertification the Commission on Water Resources, Desertification and Drought, chaired by Senator Adriana Muñoz, with the participation of UNESCO's Water Center for Latin America and the technical coordination of Geographer Elir Rojas, held a special senate session on 19 June to discuss the effect of desertification on different development sectors. The members of special Senate session will identify the synergies from each sector and look into the national plans to address desertification and its related issues. Invited guests for the special session included Mr. José Murillo, General Manager of ESVAL; Dr. Gabriel Mancilla, Director of CAZALAC; Dr. Denisse Poblete, expert in social intervention; and Carolina Vilchez, Head of the Water Office of the Municipality of Petorca. 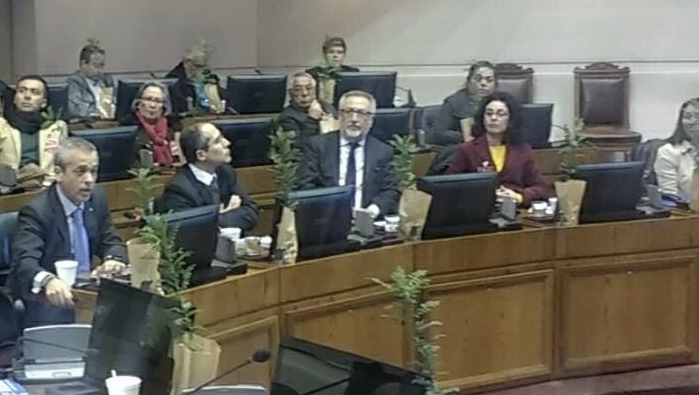 The special senate session was broadcast live on tv.senado.cl between 10.30 and 12.00 local time. 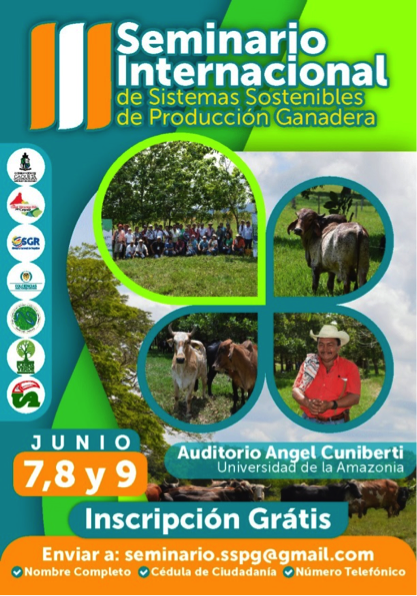 Misión Verde Amazonia held their third seminar on sustainable livestock production systems on 7- 9 June 2018 in the auditorium Ángel Cuniberti, University of Amazonia, Florencia to mark the World Day. Speakers from Uruguay, Argentina, Barbados and Brazil presented their success cases in the seminar. Click here or email seminario.sspg@gmail.com for more information. The Ministerio de Medio Ambiente y Recursos Naturales of Dominican Republic organised an event celebrating the World Day to Combat Desertification on the 19 June 2018. The event highlighted financing options for implementing sustainable land management and measures to achieve Land Degradation Neutrality. Representatives from the government, FAO, NGOs, universities and media attended the event. Ecuador hosted this year’s World Day to Combat Desertification observance event which gained wide coverage of media. For more information, visit the global observance page. The Guyana Lands and Surveys Commission, the Guyana National Focal Point Agency together with the Mangrove Restoration and Management Department of the National Agriculture Research & Extension Institute (NAREI) commemorated World Day to Combat Desertification on 17 June 2018 through restoring degraded mangrove at the Essequibo Coast, Walton Hall, Guyana. 15,000 seedlings of Rhizophora and Avicennia Germinans were planted in the designated area which is severely eroded. The Essequibo coast is considered as a buffer zone that protects communities from the Atlantic Ocean. The restoration activity engaged Walton Hall community in particular the youth. Besides, the Guyana Government lauded the call "Land has true value. Invest in it." through media statements emphasizing the importance of combating desertification and implementing sustainable land management practices. To commemorate the World Day to Combat Desertification CONAFOR, in collaboration with the Government of Coahuila, the National Commission on arid lands (CONAZA) and the Antonio Narro Autonomous Agrarian University (UAAAN) organized a series of workshops and lectures on desertification. The event held on 16 June in Coahuila was attended by Governor Miguel Riquelme and FAO representative Crispim Moreira. In addition, CONAFOR organized a youth engagement event to raise awareness of young people. Forty students from the Agricultural Technological Baccalaureat Center of Jala, Nayarit together with officers of CONAFOR visited an ongoing restoration site and the youth group participated in a hands-on exercise in restoration techniques. 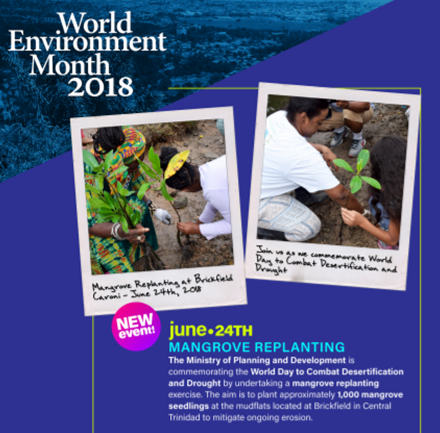 To commemorate the World Day to Combat Desertification, the Ministry of Planning and Development has organized mangrove re-planting activity at Brickfield, Central Trinidad. Approximately 1 000 mangrove seedlings were planted to mitigate severely eroded mudflats. When: 13 June 2018 from 9 am to 1pm. Where: Auditorio Batalla de Carabobo of the Bolivian Museum. Caracas. Capital district. 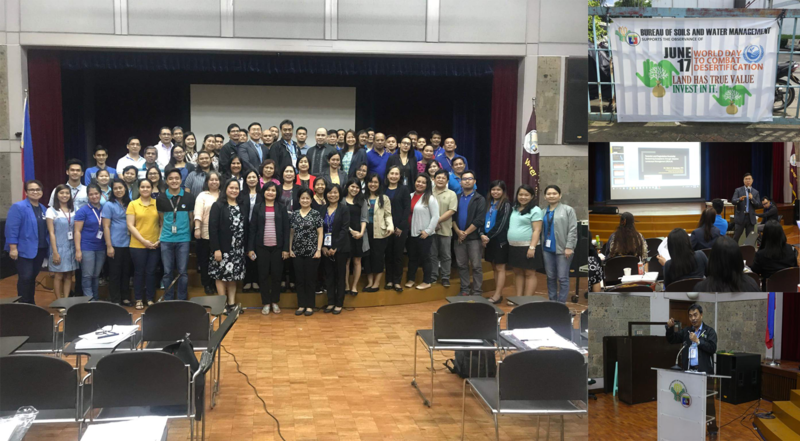 The forum brought together representatives of energy, agriculture, water and forest fires sectors, as well as community organizations to discuss the socio-economic impacts of extreme weather events such as drought. The event will contribute to the development the National Drought Plan and the progress of Venezuela’s target setting program to achieve Land Degradation Neutrality. 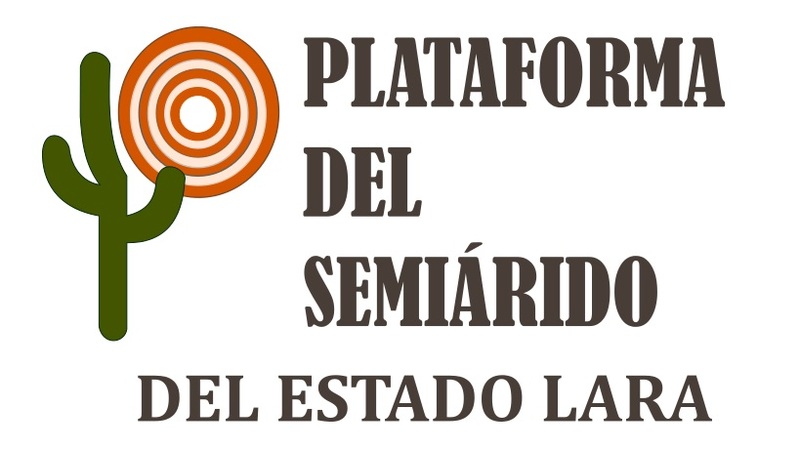 Plataforma Del Semiarido de Lara will organize a public workshop at Barquisimeto on 22 June, 2018 to mark the World Day. The event will bring together academia and the civil society to discuss and review the lessons learned from the development actions carried out in the semi-arid state of Lara. The workshop will also showcase new sustainable approaches that can be adopted in future for the sustainable development of the region. 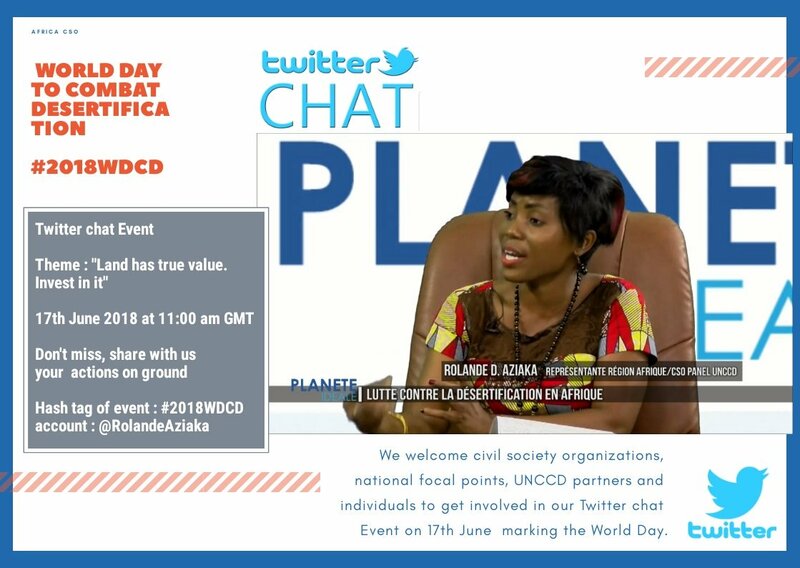 To mark the World Day to Combat Desertification, the UNCCD Civil Society Organizations of Africa will organize a Twitter Chat Event on 17 June, 2018 at 11:00 am GMT with the hashtag #2018WDCD. Civil society organisations, national focal points, UNCCD partners and individuals are welcomed to participate. FAO, in cooperation with the Permanent Representation for the Peoples Republic of China, organized seminar on “Land/Tenure and Water Technical Networks” on 18 June, 2018 at its headquarters in Rome. The seminar focused on the role of the private sector in combating land degradation, as well as highlighting investments and new approaches that have been pioneered by the private sector. The UNCCD Global Mechanism Managing Director Juan Carlos Mendoza also spoke at the event. A drought report was also launched at the event. 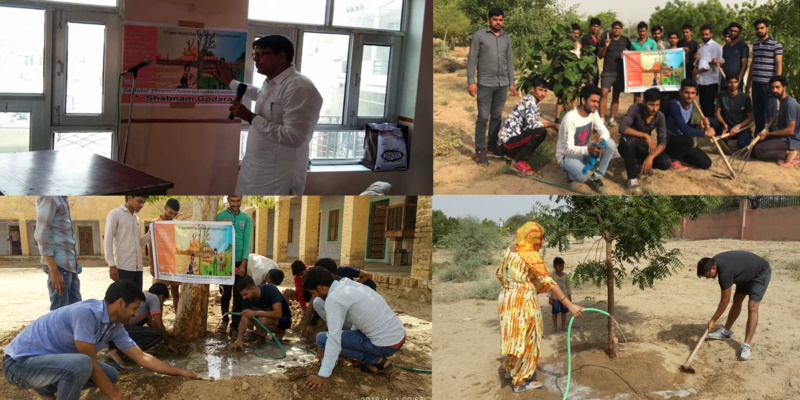 To observe World Day to Combat Desertification on 17 June, Wing Of Research In Local Development (WORLD), a leading wildlife, environment and non for profit organization of Rajasthan, India organized a variety of educational and awareness activities for youth, students, teachers. The activities aim to actively engage public in sustainable practices for conserving biodiversity of Aravalli ranges. A variety range of activities from educational lectures and discussions to street plays, seedling distribution and planting activities were organized in schools and at public places. Mr. Manish Saxena, Director of WORLD also gave a talk to the public on how communities of the Aravalli ranges could play their role in combating desertification in Rajasthan. He further explained why protecting Aravalli ranges is important to halt the expansion of desert to the fertile lands of the region. Deforestation and urbanization pose threat to the biodiversity of Aravalli. Mr. Saxena urged the communities to adopt sustainable practices for preservation of Aravalli. 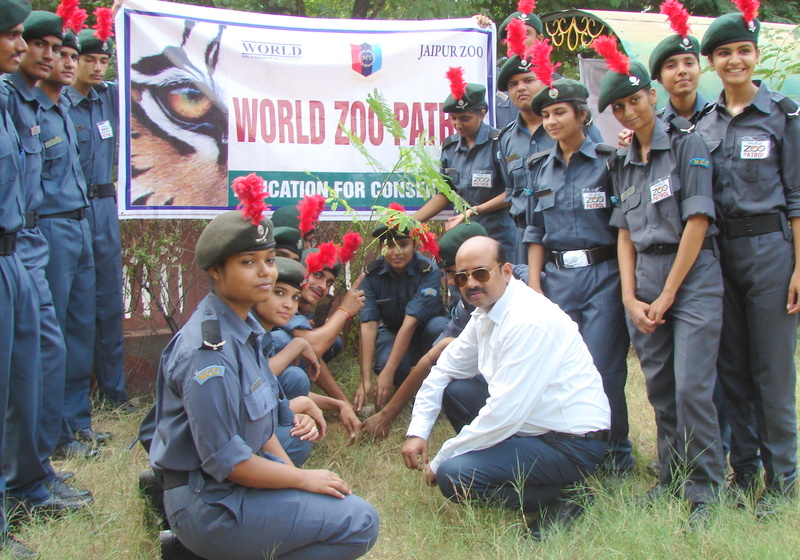 The “Greening Aravalli Campaign” was also launched together with the Youth of National Cadet Crops (NCC) in Jaipur zoo. On occasion of the World Day to Combat Desertification, Voliris will be launching the RendreLeDesertHabitable.com website, which aims to make the desert inhabitable and thus to improve the livelihood of local communities. 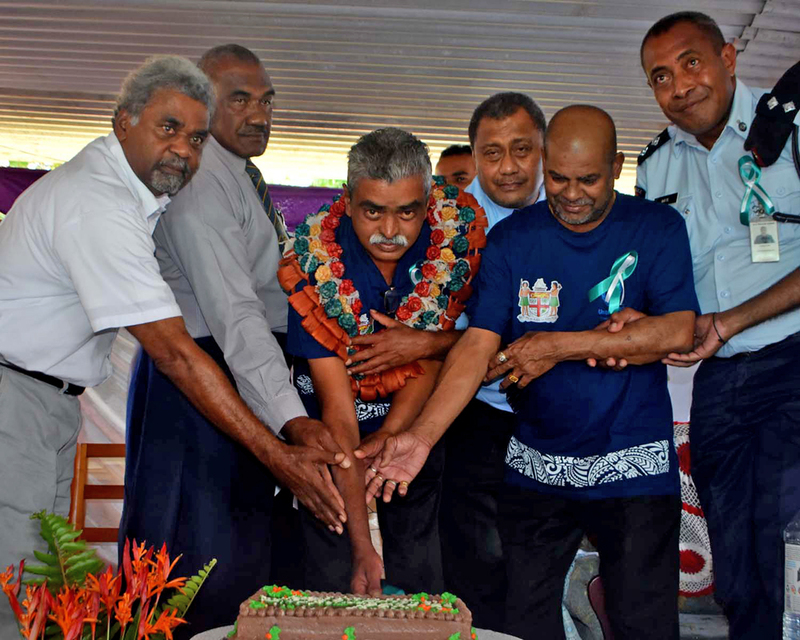 Farmers from Qelewaqa came together to held a colourful event to celebrate the World Day to Combat Desertification on 17 June. The event was officiated by assistant the assistant minister of the Ministry of Agriculture Mr Pillay. Singing, dancing and a march by the farmers' family members and public were part of the event highlight. The Algonquin Regional High School of Northborough, Massachusetts is organizing an awareness-raising campaign about the dangers of desertification and soil erosion on 6 June.